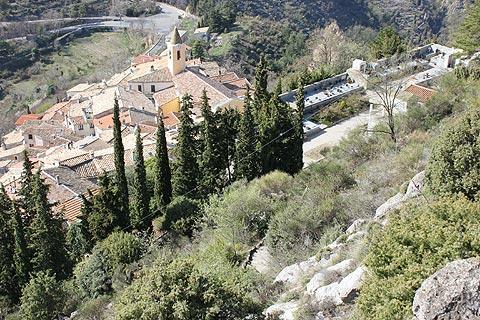 Sainte-Agnes is a small village situated a few kilometres inland from the coastal towns of Roquebrune-Cap-Martin and Menton, near the French border with Italy in the south-east Alpes-Maritimes department of Provence. 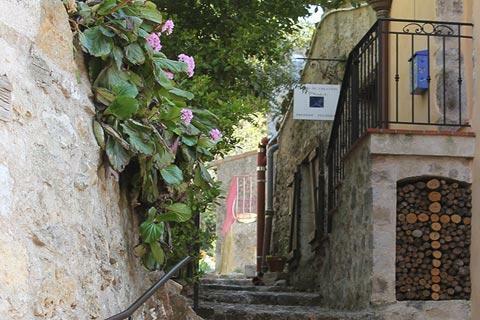 At an altitude of almost 800 metres above sea level it is claimed to be the highest coastal village in Europe, and Sainte-Agnes is also classified as one of the 'most beautiful villages in France'. 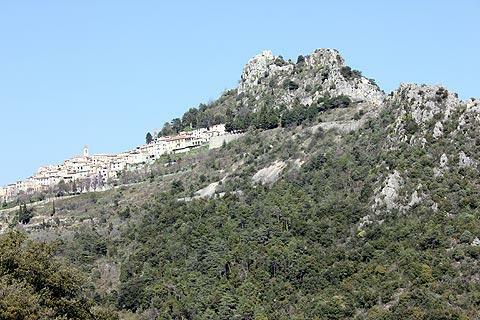 Despite its proximity to the coast (3 miles from Menton as the crow flies but a 20 minute drive along the steep winding road) the village stands high on a rocky hill giving it very far reaching views across the landscape and the Mediterranean, with mountains rising steeply all around the viillage, together creating a significant part of the appeal of Sainte-Agnes. 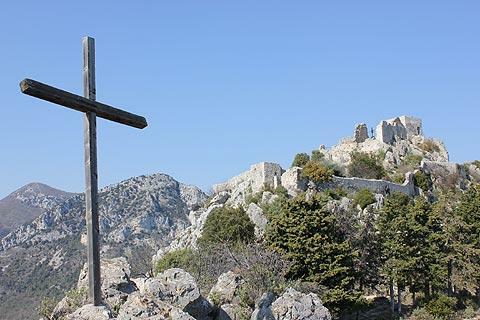 Sainte-Agnes is also a popular destination for tourists on this part of the Cote d'Azur, although the slight challenge of access means the village gets less visitors than it would otherwise. 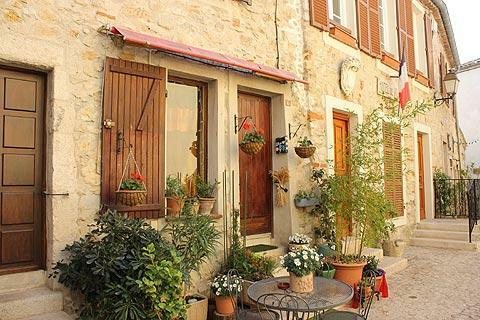 When you arrive you can park at the southern end of the village from where there are several opportunities to enjoy the views: as you look out across Menton and the Mediterranean from here you will understand why the village is also known as the "balcony of the Côte d'Azur"! Also at this end of the village you can see a substantial concrete bunker and fort that was built into the cliff as part of the maginot line defences before the Second World War. The extensive underground rooms of the fort are open to visitors (admission charge payable, open weekends only except June to September). 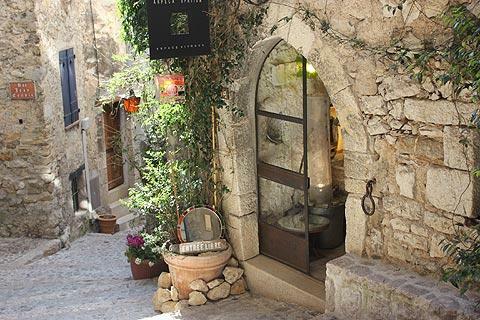 Next stroll along the cobbled streets and through vaulted passages enjoying the medieval feel to Sainte-Agnes, enhanced by numerous small architectural details, while enjoying the small art shops and terraced restaurants along the way. 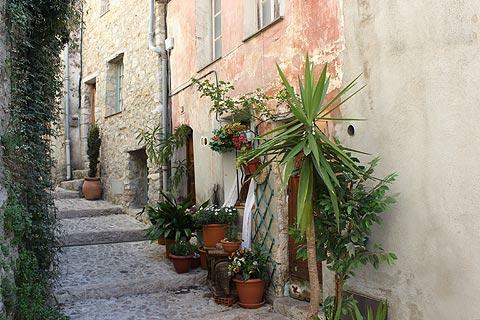 Unlike some of the perched villages in this part of Provence, most of the houses in Sainte-Agnes have been restored. One particular highlight in Sainte-Agnes is the Church of Notre-Dame-des-Neiges, dating in part from 1535 although much of the present church is a reconstruction from 1744, hence the baroque design. Another highlight of a visit to Sainte-Agnes is the ruins of a castle built in the 12th century as a retreat from the Saracen invaders. Parts of the original castle date back as far as the 10th century, making it one of the oldest castles in France. The castle was also on the frontier between France and Italy in the 14th century and saw many battles, finally being destroyed in 1691 (although not completely and the castle was again used in the 18th century). 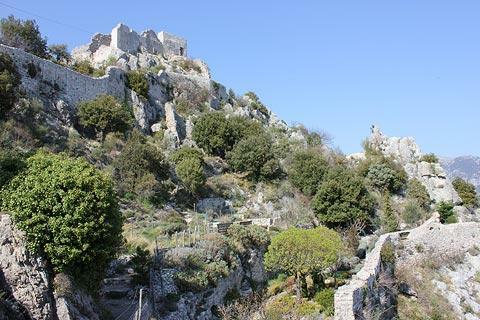 The castle is a further steep climb up a path from the top of the village but well worth the effort - principally for the views along the coast. Note: when you are on the platform at the top of the castle look across at the next rocky pinnacle. There is no visible way that the rock could be reached without climbing equipment - but you will see there is a section of wall very near the top. Where did that come from! 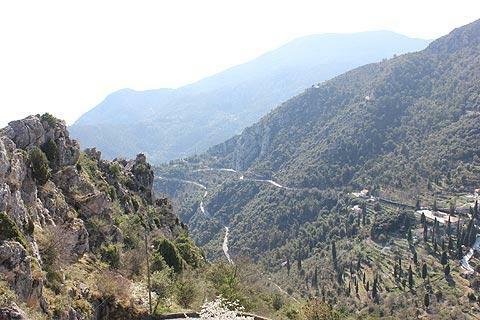 The medieval village at Gorbio is not far from here, and you can also visit Castellar, and another remarkable hill village can be visited at Peillon to the west of Sainte-Agnes (only about 20 kilometres drive but along a slow mountain road so the journey takes about 45 minutes).